We woke up early and practically ran down the last 2.5mi of hill into Fontana Dam for our nero day to binge eat a hiker meal for breakfast, rather than dinner like we had in the past. 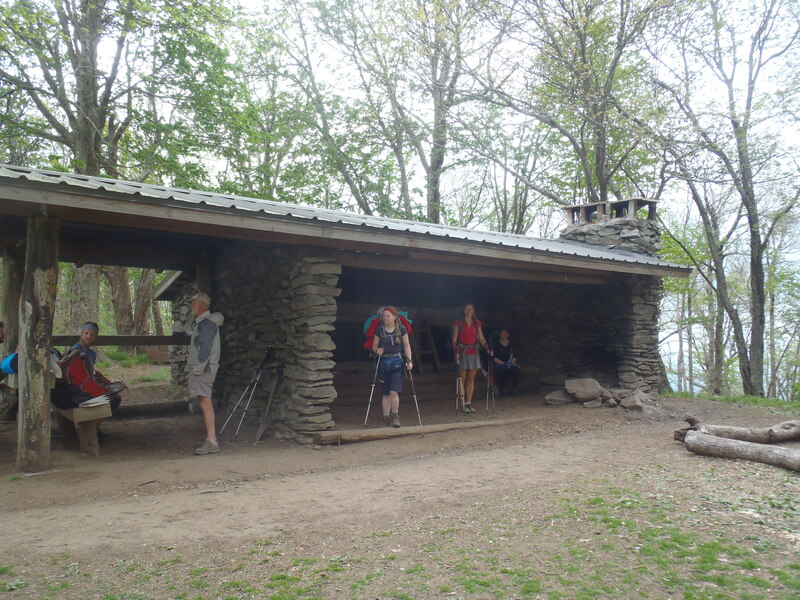 Breakfast is awesome, and the thought of an overstuffed omlette with a side of bacon is music to the ears of a hungry hiker. 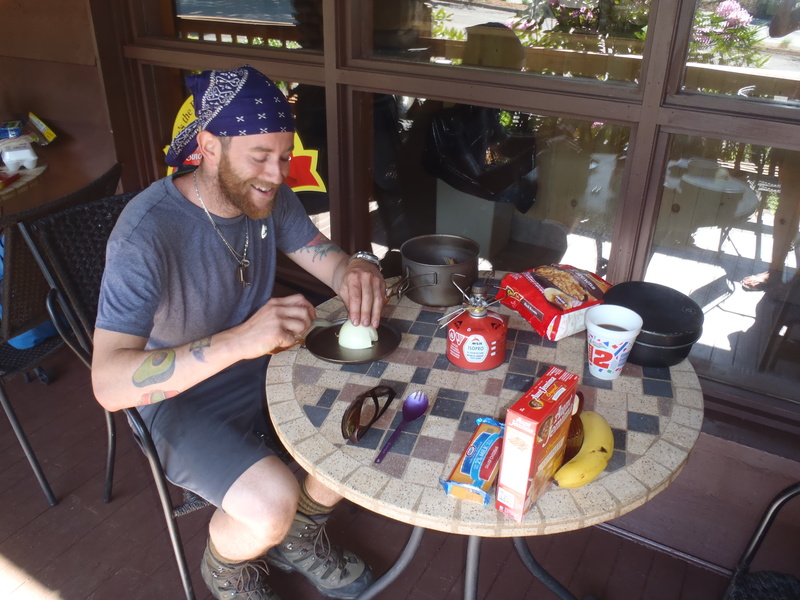 We hitched into town to learn that Fontana isn’t much of a hiker town, rather it caters to people with more money and smaller appetites, and we just couldn’t afford a $25 tiny breakfast burrito! So what did we do? Make our own on the front porch of the general store, of course! 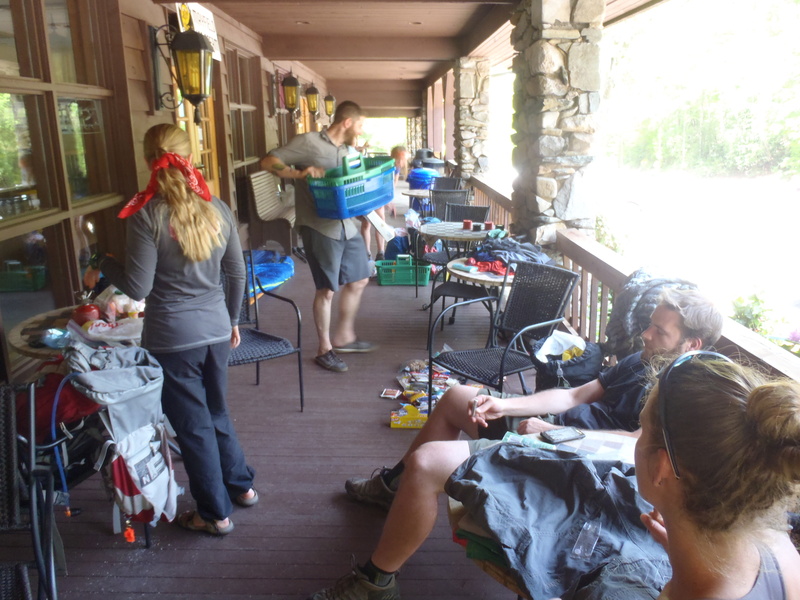 Making breakfast and doing laundry on the front porch of the Fontana Dam General Store has to be one of my favorite memories on our young journey so far. Between the four of us we had three camp stoves going and $40 of eggs, cheese, veggies, bacon, pancake mix, homefries and of course a six pack of beer. We set out to make ourselves a proper hiker breakfast! When it was all said and done the smell of our cooking bacon and scrambled eggs attracted another half dozen of our “famished” peers. 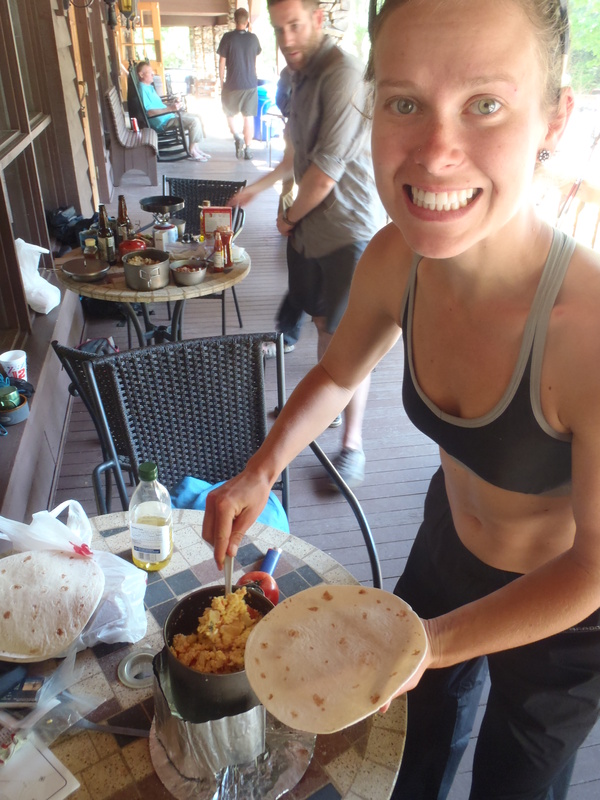 After a couple loaded breakfast burritos each and another six pack the four of us (‘Chef’, ‘Chubby Bunny’, Lindsay and I) turned the leftovers to the growing crowd of hiker vultures and made friends one piece of bacon at a time! After breakfast and laundry we had a bit of a to-do list to accomplish while in Fontana to prepare us for the Smokies the next day. Well, apparently porch shade, good beer and a lawn chair have a strong magnetic pull on hikers and we happily wasted most of the day on the front porch of the General Store with about a dozen other hikers coming and going as they pleased. We left the front porch with just enough time to buy some ingredients to cook an evening meal, to run up to the hotel and use their computer to put up a blog post, and to hitch a ride to the trail to walk the two miles in to the “Fontana Hilton”, a 22 person shelter on the edge of The Great Smokey Mountain National Park. 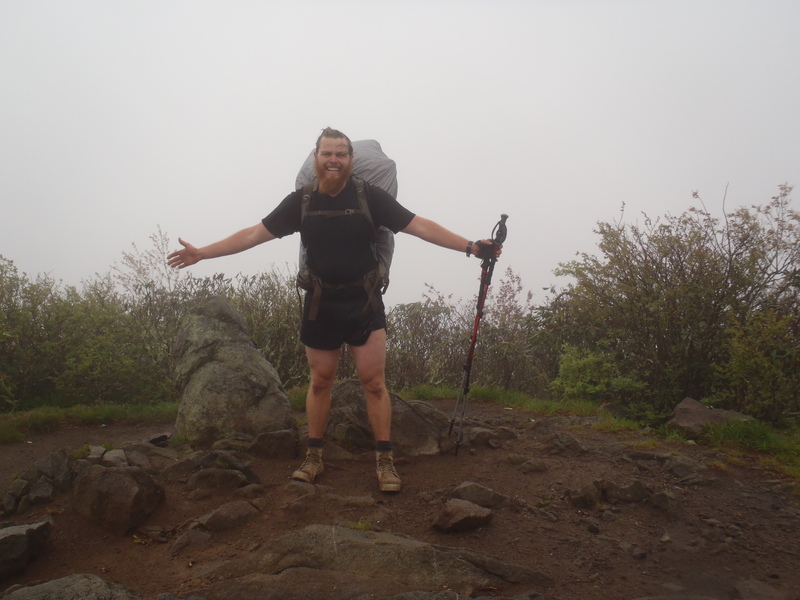 When the beer and food disappeared, the time came to actually start hiking into the Smokey Mountains. 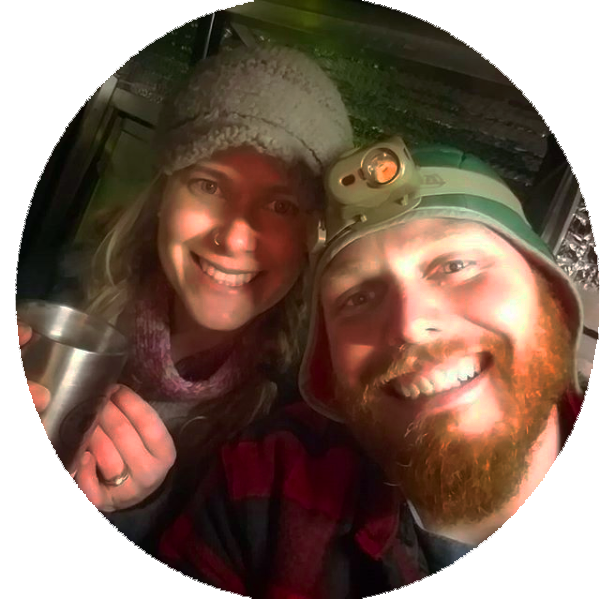 As many of you know, our 5 day hike through the Smokies was cut in half on the morning of day 3 when Lindsay fell and dislocated her tail-bone coming down Clingman’s Dome requiring us to take a week or two off the trail. Despite that minor hiccup we had a great time hiking through the ‘hardest part’ of the Smokies. The first day stayed nice and cool and we were able to get a solid 14 miles in before the rain started, parking us at a shelter for the night. 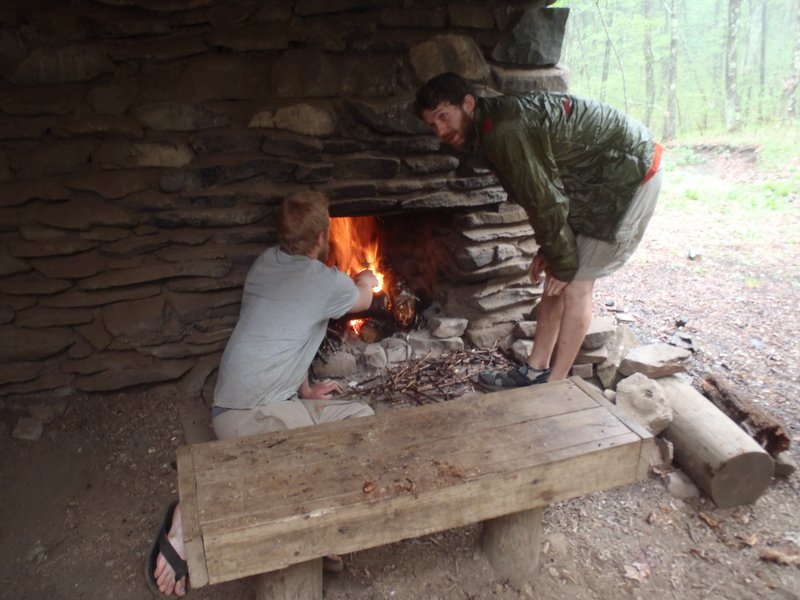 Our baptism as AT thru-hikers came the next day when we hiked our first day in the rain. The rain started about an hour and a half into the day’s walk and at 6,000ft above sea level it was a cold 50 degree onslaught. Prior to that day we had lucked out and only had to walk through some light morning showers a couple days. Well lady luck only lasts so long and it poured on us the rest of our 16.5 mile day. When the rain shows up, the vistas, views and fun all disappear and most AT hikers put their heads down and just walk. Lindsay and I are no different from the norm so we filled our pockets with a bunch of power bars and jerky and just kept putting one foot in front of the other all day until we made it to our destination for the evening to put on some dry, warm clothes and get a fire started. We had our closest encounter with wildlife that morning, stumbling upon a large boar hiding from the rain under a thicket of rhododendron trees. He voiced his concern of us encroaching on his territory by snorting and stamping his feet at us; we responded by running away with our tails tucked between our legs!! Lindsay denies that she screamed. 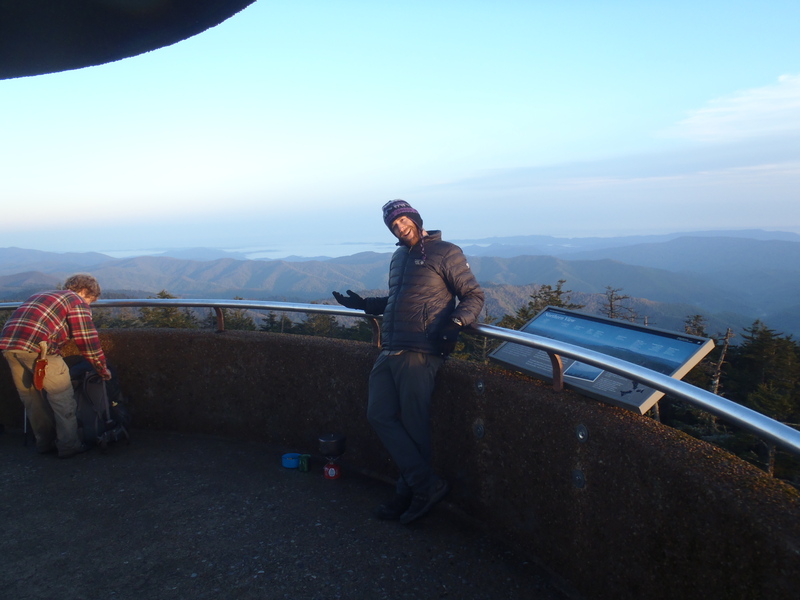 During the evening of this rain storm our shelter crew decided that if the skies were clear the next morning, May 11th, we would get up at 4:45am and hike 3.3mi to the summit of Clingman’s Dome, the highest point on the Appalachian Trail, to watch the sun rise. In an awesome stroke of luck the skies cleared up and we struck off from the shelter at 5:15am with headlamps blazing our path to try to beat the sun to the top of the mountain. 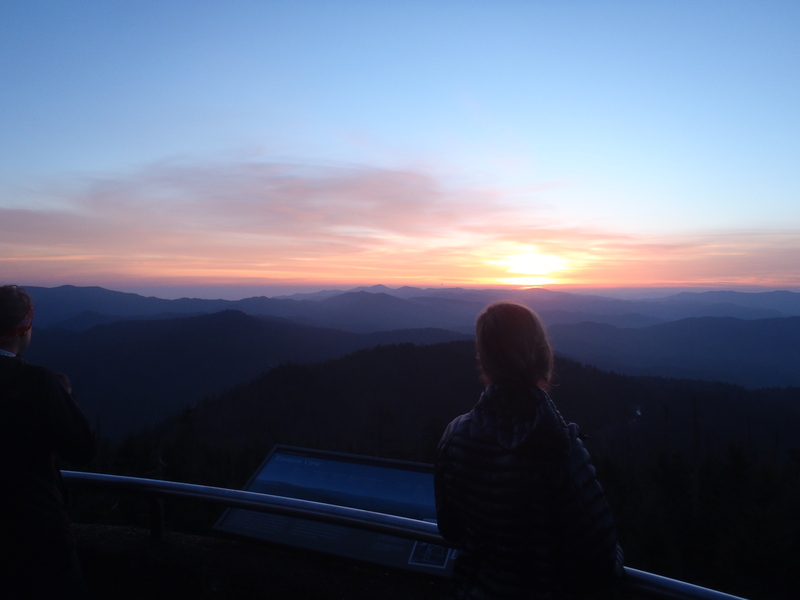 Lindsay watching the sunrise at Clingman’s Dome. Our camera doesn’t show the colors that Lindsay saw. Walking up the ridge line to the top of Clingman’s Dome was one of the prettiest mornings I have ever seen and Lindsay’s first ever mountain hiking sunrise. We found out later from the ambulance driver that the morning we saw the sunrise ended up being a brisk high-30’s without the wind chill. After practically sprinting the last 1/4 mile to catch the sunrise and being soaked with sweat when we made it, I fully believe the temperature prediction. Unfortunately, our great start to the day had to take a turn for the worse when we continued our hike after the sunrise. 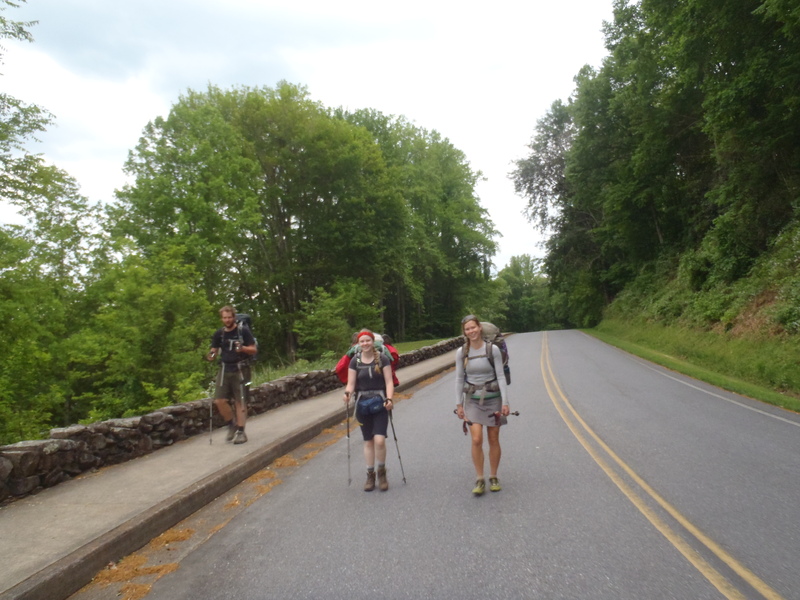 Hey, we’ll be back to finish the Smokies and we still have 1,986 miles of hiking ahead of us before October 15th that we fully plan on completing! Hi Lindsay We are all wondering how you are doing. Love mom dad Chelsea and Breanna Breanna is here for peters wedding and luckily to have a birthday brunch.